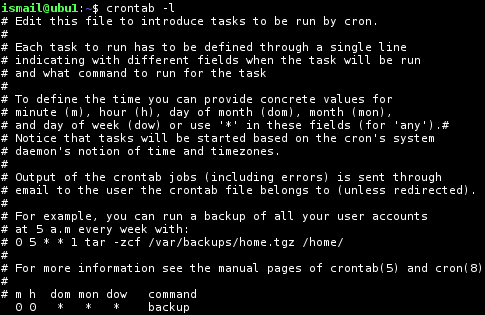 Crontab is a daemon continuously runs and fires specified jobs/commands. Crontab file is a simple file holds entries about jobs. These entries includes time information and the command which will be executed. Crontab is simply referred as cron too. The operation is done by cron daemon. The status of the cron daemon can be listed like below. Stopping cron is very easy as looking status of cron. If cron service is stopped none of the described cron jobs will work. Starting is similar to stopping. 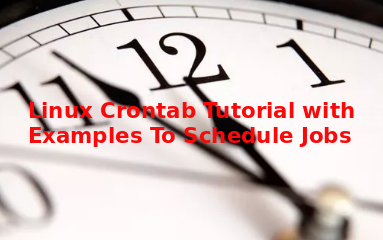 In order to execute scheduled cron jobs we have to start cron service. 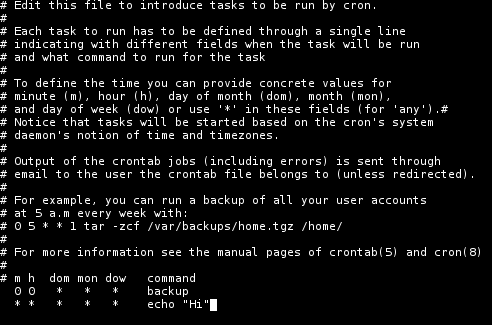 Cron table simply crontab holds entries about jobs. Each line is one job. Entries are in text format and easily editable. We can list jobs with -l parameter. Following line is one job where backup command will fired. Line starts with # is command and there is some explanation about the columns below. Another useful graph is like below. To add new job to the crontab crontab file will be edited. We have opened crontab file in edit mode and add following line as job. We have put asterisk for all columns so echo “Hi” will run each minute of each hour in each day of month, each month, each day of week. We will see more details below. While exiting saving file will active newly added job. The magic and detailed part of cron is timing of jobs.Following table provides shortcuts about timing examples about cron. While running jobs new environment will be created. This environment have the following environment variables. In this example user attacker can not add job to the cron. What if we do not need previously defined cron job. We can remove the job easily by editing cron configuration file. We will use -e option to remove all jobs. We can also specify specific user to edit given user jobs. We will use -u option which is shortcut for user . We will also provide user name. In this example we will edit cron jobs of the user ismail . As we can create cron jobs easily we may need to list them. We will use -r option in order to list all stored cron jobs in the configuration file for the current user. We can also specify user name in order to list only given user cron jobs. We will use -u and -r options with the user name. In this example we will list cron jobs of the user john .